Home Hot Deals Latest News Slider Precision Air to resume Comoros operations from 11th October 2016. 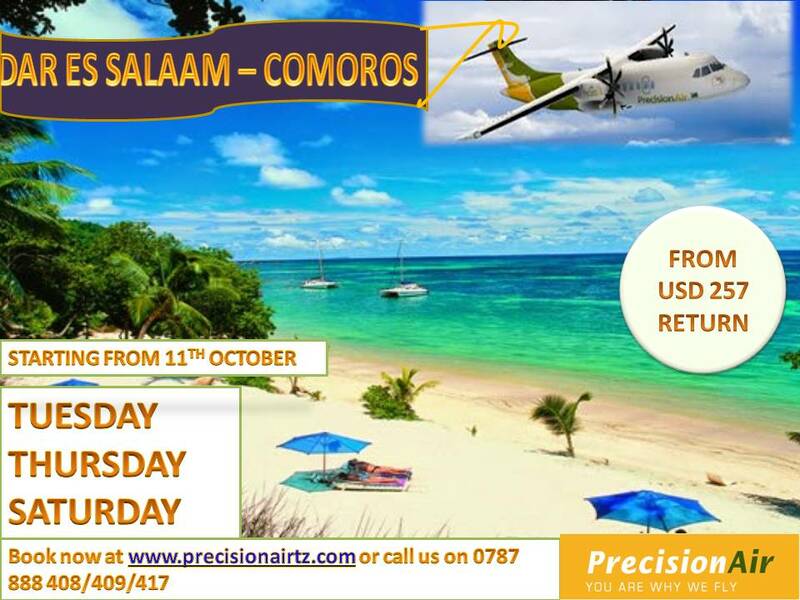 Precision Air to resume Comoros operations from 11th October 2016. Tanzania’s leading Domestic Airline Precision Air will resume its operations to HAHAYA- Comoros effective from 11th October 2016. Flights will be 3x a week on Tuesdays, Thursdays and Saturdays with a return fare starting from USD 257. Precision Air suspended its flights to HAHAYA earlier in 2014 while undergoing a strategy review which also involved route rationalization. a private airline based in the Comoros, is the only airline that operates on this route. This will be a second regional destination for Precision Air after Nairobi. Domestically Precision Air flies to 11 destinations. From its main Hub Dar es Salaam Precision Air flies to Arusha, Kilimanjaro, Mwanza, Bukoba, Musoma, Tabora, Kigoma, Mtwara, Zanzibar and Pemba.